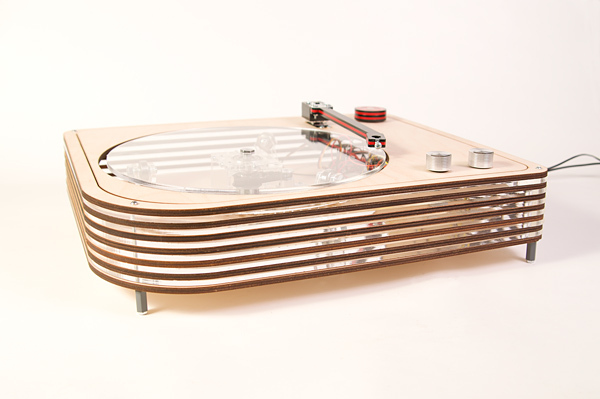 If you’ve been following any of my adventures since I first mentioned a Turntable Drawing Machine, this is the result. 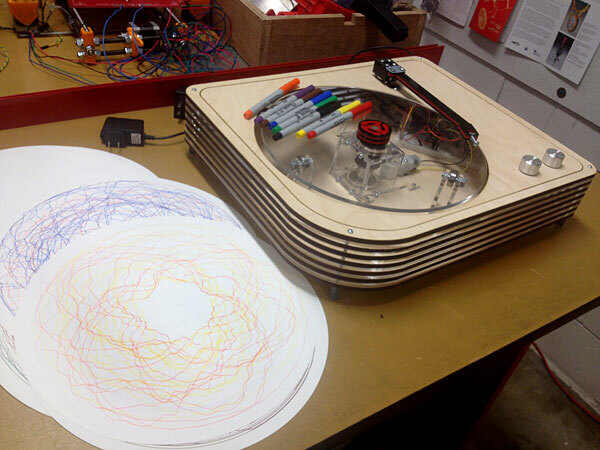 The Turndrawble is a machine that uses a spinning platter and a movable arm to create drawings. I also wanted to build a machine I could bring to events and allow people to use in order to create drawings. Often in the past I’ve brought drawing machines places but I’ve ether operated them or they’ve operated (semi-) autonomously. The Turndrawble presents a chance for the viewer to become a participant. 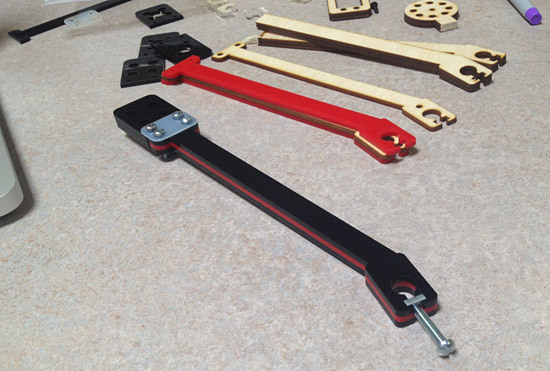 I designed these two arms that would fit into slots cut into the base of the machine, below the platter. 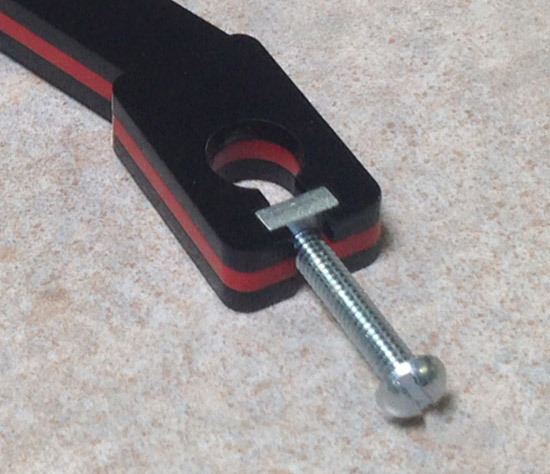 Each piece would be locked into place with a 3mm bolt, so there’s holes and t-slots for those. The extra piece you see on the bottom (with the 4 slots and 2 holes) is the mating piece. This was designed based on the arm pieces fitting into it, and I would only need to cut one (hopefully) to test the fit. 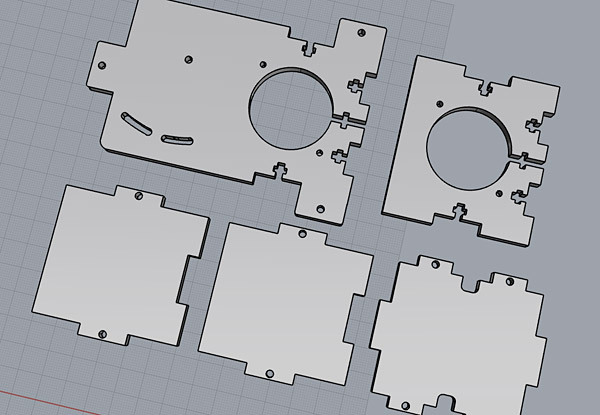 As a bonus, when I share the files for this you can decide which pieces suit you better, depending on the availability of an 8mm tap in your workshop. No tap? Just use the larger hole version and a nut instead. 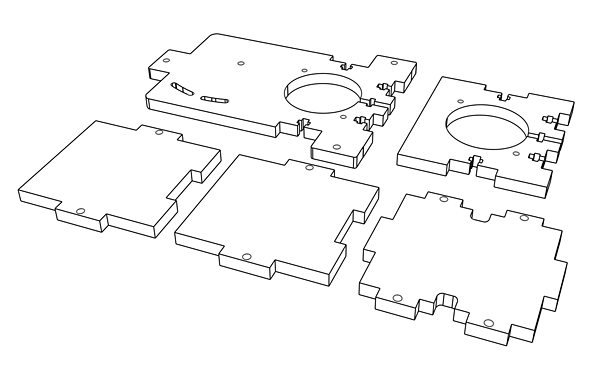 When you’ve got a laser cutter and lots of scrap acrylic, it makes a lot of sense to make your own washers and spacers and standoffs. (Assuming acrylic is up to the task of what you’re designing.) 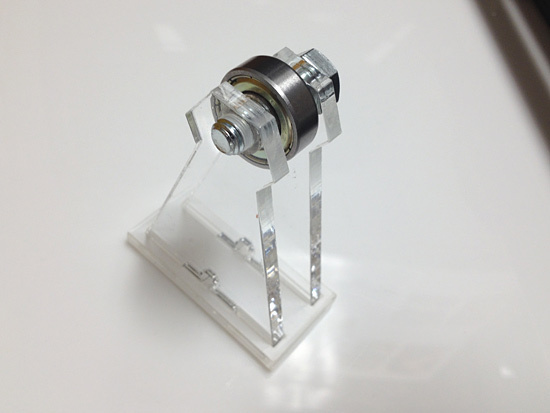 The spacers were sized to match the inside part of the bearings allowing the outer part of the bearing to spin freely. The one thing that making and using acrylic nuts would have allowed would have been adjusting the height of the bearing. 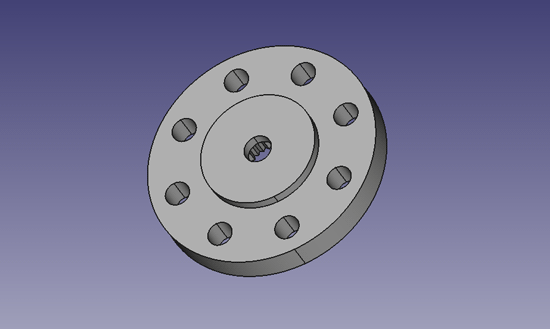 I could have created a slot for raising or lowering the bolt and bearing combo, so with this design featuring the tapped holes, there was no room for adjustment. Luckily I got it right by the second (or third) attempt. Here’s a shot of the spacing of the bearing holders below the platter. It worked out well and I got the math (mostly) right. I may end up making a new bottom in the future to account for other faulty measurements this time around, but I’ve already adjusted for them and things work well enough. 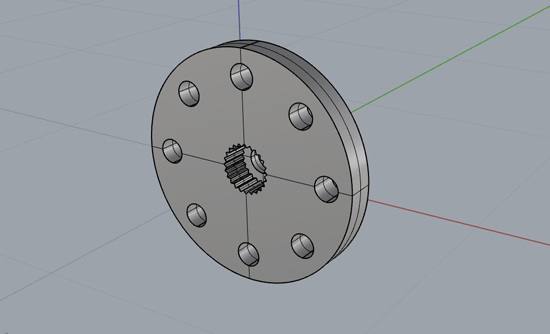 Luckily I was able to open the STEP file in both Rhino and in FreeCAD! It’s like I won the CAD file lottery or something. But seriously, if there’s ever a competition to convert from one format to another and then another and another… I think I can win. I was able to get what I needed to get the hole spacing right, which is all I really needed this time. The holes are tapped for 6-32 screws. Once again I’m mixing Imperial and Metric. Sigh… Mission (somewhat) accomplished, I guess. 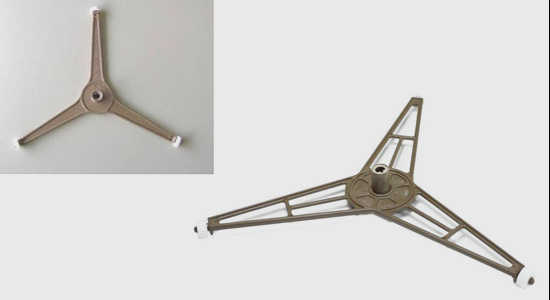 The arm consists of three layers of laser-cut pieces stacked up, and screws to hold them together. I played around with materials a little bit, trying wood in the center, but finally choosing the red acrylic. I thought about clear, but there is at least one other red element right now, and possibly more to come, so I chose the black and red combo. Always a good choice! 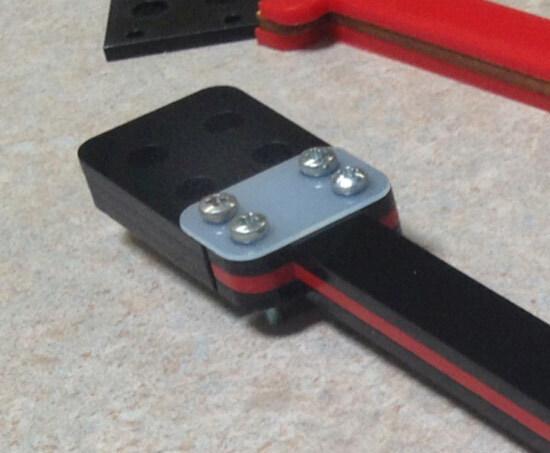 There’s also a hinge I cut from a 1mm thick plastic I got from the Midland scrapyard. (Windell from EMSL thinks it might be polypropylene.) The laser cut it fine once I figured out the proper settings… and covered it with masking tape on both sides. And yes, I did borrow a few ideas from the Egg-Bot design. Sharpies, FTW! Pen holder designers unite, and all that. There’s a 8-32 square nut in there, really snug. I do not have a nice thumbscrew like EMSL uses… yet! 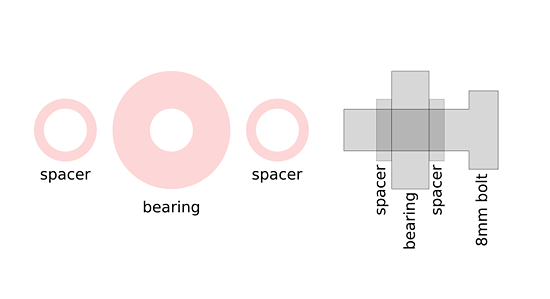 There comes a time when every designer who designs things in two dimensions that get assembled into something that has three dimensions wants to have a diagram with some… dimensions. 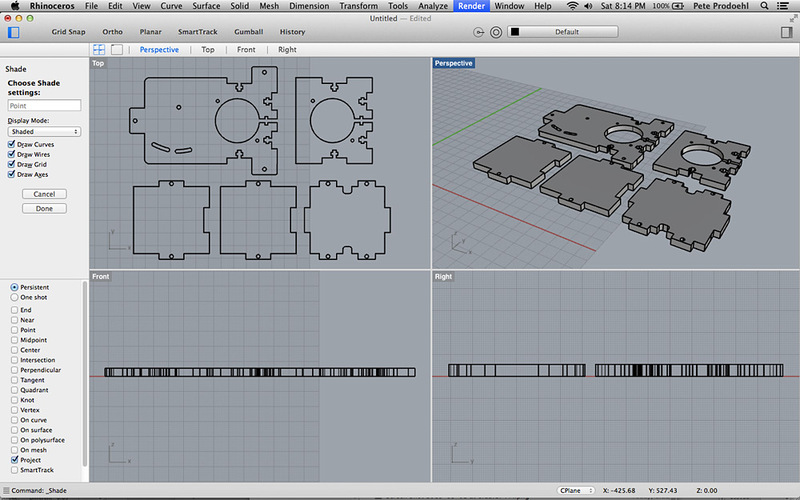 Above is a dimensional illustration of the parts of the mount for the shaft for the machine I am building. If I were to provide assembly instructions I’d probably want such a drawing. Here are some notes on the process, so I can do it again next time. 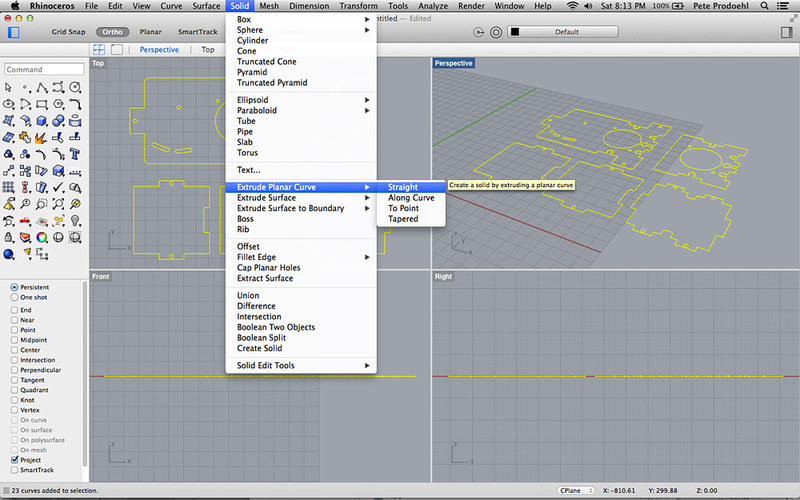 Our vector file is now in Rhino! Double-check to make sure each line/object did not get doubled-up. I’ve had it happen a few times but could not conclusively determine what causes it. 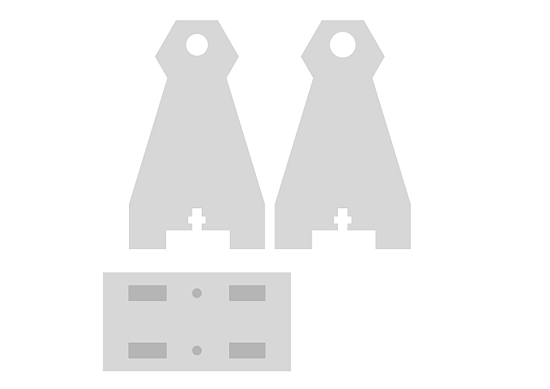 It may be the width of the stoke of the objects in Inkscape. 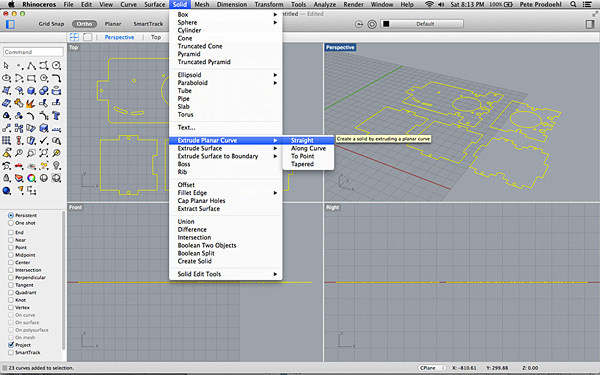 You can now extrude your object(s) in Rhino. I make them the height of the material I am using. 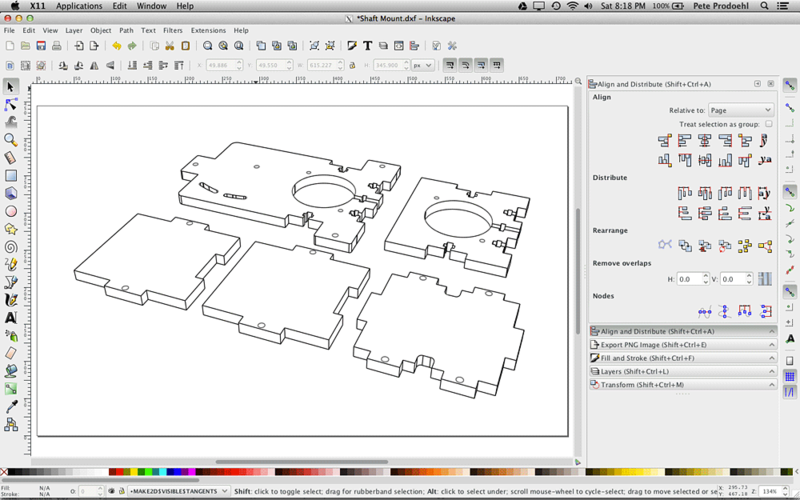 Oh, I’ll be laser cutting these pieces with 4.45mm acrylic. YMMV. Make sure the holes are really holes! If not, re-read the part above about objects and holes and such. You need to difference any cut out things! Now you can move your new object(s) because the original vector lines we imported in are probably sitting right underneath them. 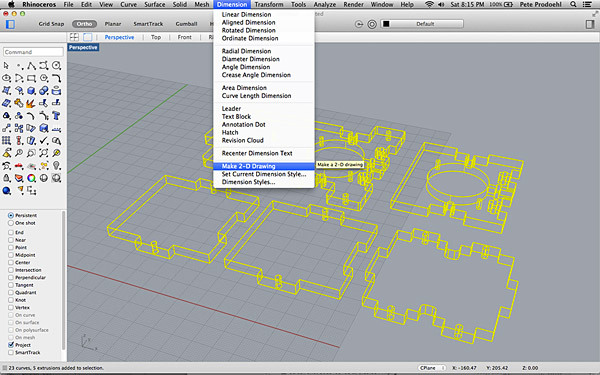 Swing your object(s) into the view you want… get that angle just right, and then choose “Make 2-D Drawing” from the “Dimension” menu. You should now have a 2D version of your 3D object. Rhino should also select it by default, so you can use the “Export Selection” menu to save it out as… A DXF file. :( Sadly, Rhino cannot export as an SVG or vector PDF, or even an EPS file. 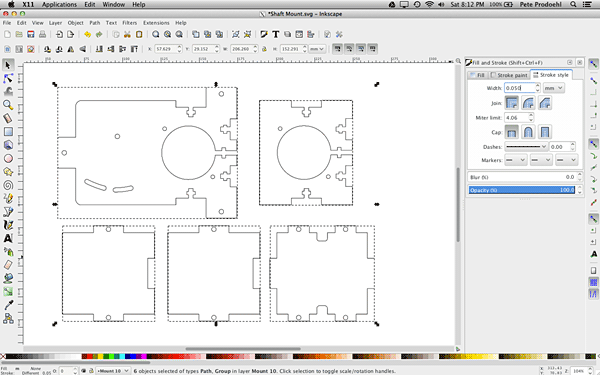 Rhino can export as an Illustrator file (.ai) but Inkscape cannot open those. The AI file it exports starts with “%!PS-Adobe-3.0″ which is probably a format from that was popular in the 1990s. 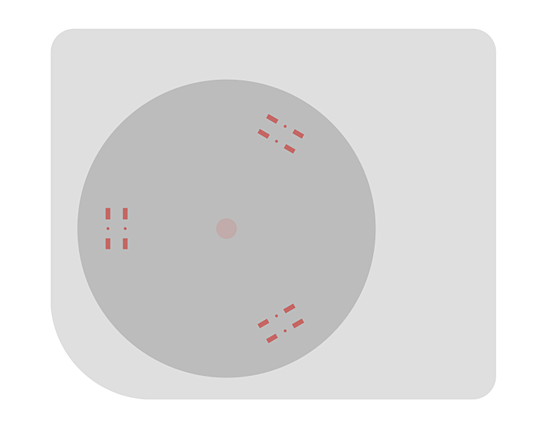 Anyway, we can certainly import that DXF file back into Inkscape and work with it, and make it look like a nice vector drawing. Mostly. Sort of. I mean, if you want to just fill it with a color or change the stroke, it’s not quite that easy. 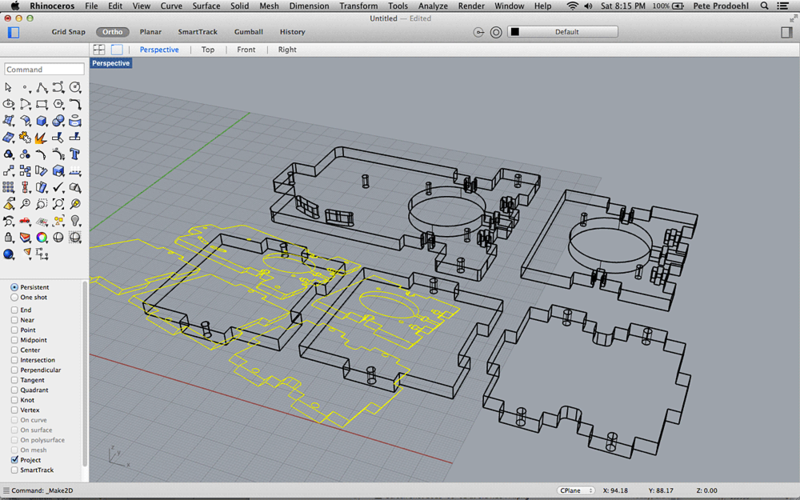 If you just want a line drawing that isn’t too fancy, mission accomplished! Oh, and not that I want to turn Inkscape in a 3D application, but I could see great value in being able to extrude and change the view angle of a vector drawing… maybe through an extension? Note: Lots of comments about this post are on Facebook.